1994. I came back to India. And never looked back. My seven-year US stint was passé, except for a nostalgic trigger each Olympic year. No, nothing to do with sports. Rather, the game of thrones that is revisited each Olympic year, in the land of the free. I still vaguely recall the 1992 presidential debate. Mr. Clinton vs. Mr. Bush. It was a treat to watch the naked vulnerabilities of these two powerful men. Our Indian democracy is devoid of such crackling displays. For over two decades, I have envied the great American style of making choices. 2016. Times have changed. It’s Mrs. Clinton vs. Mr. Trump now. My envy has evaporated. Of course, my story here has nothing to do with my envy. And no, there is no sarcasm intended towards our American friends. Instead, this story is about my own demons. Six months ago. I started watching the US election primaries with keen amusement. The circus was spectacular in both parties. 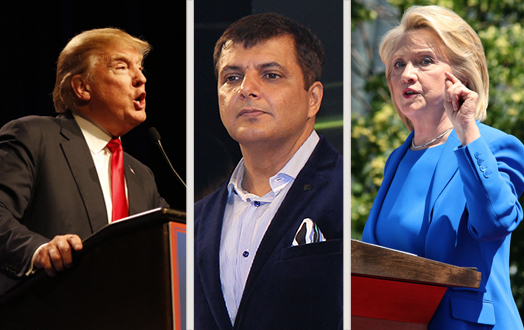 This election had unusual battle lines, Insiders vs. Outsiders. The Insiders (such as Hillary Clinton and Ted Cruz) represented political institutions—steady but too conventional. The Outsiders (such as Bernie Sanders and Donald Trump) represented the rising rebellion—unconventional and rather risky. Which approach is more sensible, I debated internally. The subject warranted deeper domain expertise. So the music & movie channels in my home gym went on hibernation mode. The alternate days—cardio-day movies and muscle-day music—were replaced by CNN. My personal trainer whined, but it is easy to bulldoze old timers. I started micro analyzing the political commentaries. Four months ago. I was in the USA on an extended business trip, east to west, and everything in between. By now, the election primaries were practically over. Trump was leading the nomination for the Republicans, Clinton for the Democrats. The topic of politics would inevitably pop up during my meetings. My takes were restrained. You never know the affiliation of the other person. Treading cautiously allows you to hedge. I mutely absorbed the unbridled passions on the dining tables, often when the wine glasses were one too many. My intellect was ignited. My smart phone buzzed with continuous streams of political updates as I hopped from one city to the next. Every night, the TV channels in my hotel room would flip-flop from one news channel to another. The broadcasters’ right or left leanings would bring out the ‘contrasting’ flavors of the day’s ‘identical’ news stories. Does truth have multiple versions? Who is more right: a fearless talker or a guarded diplomat? Is ‘political incorrectness’ another name for ‘racism’? Should the vote of the younger generation count for more? What should be our priority: family or society; country or planet? Two months ago. Back in India, I kept sinking in a political abyss with each passing day. Now the primaries were behind us. The losers had sheepishly retreated to the sidelines. According to the opinion polls, the undecided voters were hurriedly making their choices, only to change them back the very next day! The pace was rapid. The morning CNN was not enough. My dawn workouts were only a warm up. Through the day, I would track CNN, FOX, NBC, ABC, and CBS for their diverse takes. The New York Times, Washington Post, Boston Herald, The Guardian, and Reuters for their breakaway stories. The Huffington Post and RealClearPolitics for their opinion poll of polls. My brain furiously navigated through a maze of conflicting signals. Is it possible to compartmentalize our human race? Right vs. Left? Celebrity vs. Commoner? Young vs. Old? Muslim vs. Non-Muslim? Caucasian vs. The Rest? Educated vs. Uneducated? Men vs. Women? Rich vs. Poor? Politician vs. Non-Politician? Liberal vs. Conservative? One month ago. Then it happened. One hectic afternoon, I cancelled an important meeting. Why? Because I was busy googling a breakaway political story. The realization sank in. I had been consumed. Hooked. Out of control. Who wins the US election was no longer relevant. I had a bigger problem, Obsessive Compulsive Disorder (OCD). I was trapped in a whirlpool. I had to snap out of it. I understood the problem. And I knew the solution. Nip it in the bud. I had to switch off CNN during my morning workouts. By inheritance, the rest of the day would fall into place. Logical. But it didn’t work. CNN just wont switch off. My remote control didn’t give a hoot for my logic. So I went ahead and got rid of my remote control! How? I switched my tri-weekly treadmill cardio to a personal Zumba teacher. The alternate weight training days, I enlisted the skills of a new trainer—someone whose routine I was unfamiliar with, thus forcing me to stay focused. The morning CNN went off air. The rest of the day gradually started behaving itself. Over the last few weeks, I have regained my balance, and have switched back to my old routine, with my original trainer and treadmill. And, of course, my music and movie channels are back with gusto. My monster has been reined. Whether Hillary or Donald wins, the world will go on. And even if it doesn’t, there is nothing I can do about it. A very good read..the best line was – It is for each one of us to discover our own ‘therapist’. And we better hurry, for at the end of each road of obsession lies grave destruction…Always believed in having a conversation with you own self, and everything else falls in place. I am great fan of your writings. I follow your blogs religiously and what inspires me is WHAT you write. I lie amused reading your blogs , wondering at your observation skills and you are a master at that. Moreover, your pieces are bold in the sense you write about whatever you feel like without giving it a second thought. I think , thats something which connects you to your readers. Its a great motivation reading you. Biggest of all, You have always taught us something. Very true, I also suffered from same mental state while following India Politics. “Is AAP doing good or BJP is right?” Following News website on each hour, checking first thing in morning. As usual very well written. It’s true it is OCD, but sometimes we need to take sides because we are part of the game directly or indirectly. If we can spend time for leisure it is also required to spend a little time for issues on which future of ourselves and offsprings is based. Balance is only the key. Democracy is like Chariot of Jagannath, everybody needs to pull though his/her contribution is miniscule. So true..OCD happens with most of the people. The expression here is simple yet effective. Sometimes people do realize about OCD, but it happens again and again. Very well written blog! And it is quite true that without realizing, we keep on thinking about things or people or their acts, even if we know that they are not under our control, seems to be a serious OCD. And we should think of creative ways to get over it! One of the best pieces of my choice! I was/am also struggling with OCD with a specific topic on Youtube. My YT channel subscriptions, caches, cookies were worsening the problem by feeding me similar content continuously till I completely stopped browsing YT. Wow! what an awesome read and a totally different approach. Yes each needs to find one’s own therapist. An absolute eye opener. Wonderful… So much to think about & introspect on!! The last line brings in great impact..
very well written.. I am back to reading your blog after a long time.. I think we all have some sort of OCD within us. It is about a situation, place or a thing, may be even thoughts that we always feel connected to. Though, we may not be “visibly” connected to them. There is a connection that we may feel but cannot see. We can try and resist a compulsion, but we cannot stop the thoughts. Our mind would still be there, with those thoughts. Once cannot run from the obsessive thoughts and nor can one avoid the resultant. It is all in the mind. Only thing that would work is confront and overcome it. OMG, what a blog. Until the last 2 paras, I didn’t know what point you are going to make. And as always, this was a thoroughly entertaining post, with an excellent message! very well written.. Sir,I am continuosly read your blog…I always got a lot of motivation by reading each and every blog…sir, from long time I have one dream with me and that is “I want to meet you at least once to share all my feelings about motivation which I got from reading this all blog”…so,sir please avail that opportunity at least once to meet you…I am waiting…Rahul Rajguru. too much of anything is disastrous. The interesting part is that you identified, aware, accepted the situation and choose to do come out of it. With most they probably seem to cling on to the rush it gives. Having read quite a few of your blogs, I can say that you are Amazing with co-relation. Earlier you beautifully co-related your drive route with various aspects of life and here you were brilliant in picking up the US Presidential election with OCDs. I also strongly believe that you make special efforts to make the titles attractive and almost compel us to read… which of course is an amazing art. Too much of anything is bad. As cliched as it may sound, I have come to realize it as a golden / universal rule that applies to a wide variety of scenarios – individual or societal. One should try and remain balanced. Though going by the same rule, too much balance probably has its own perils. It going to be a tough election but India’s future of IT would depend a lot on this according to me. Reason behind this is the complete support, software as well as BPO industry is outsourced. Now it will be the one who supports outsourcing should win as a large number of people whose bread and butter depends on outsourcing will be affected. Exactly this is what happened to me. Obsessed with the political drama. Day in and day out my cellphone was buzzing up with Twitter, Facebook, News app notifications on every single event happening or any chores done. Instead of watching routine TV series suddenly the whole US political drama and documentaries became my movies and Television shows. Few days back, looking at this obsession my roommate switch off evey single piece of gadget I have and took me out for a drive. At that particular point of time, I realized no matter what happens in US people here in India are not going to get that effected and things are going to be as they are. Wow! Such an interesting topic with a totally different attractive title with no co-relation. I too was following the US Presidential campaigns, elections, debates and mockeries a lot; thought that when an oldie an actual good guy (from my perspective) lost the democratic seat, I thought to myself that no matter who wins this time, the American Citizens might be the ones to lose after all by making same old mistake if they choose a guarded diplomat or make a new mistake if they choose a fearless talker. We have to think innovative ways in order to let go of our OCDs, I’ve tried a few and succeeded in overcoming them and few are still in progress. It’s an Amazing article and always admire your writing. 🙂 What a nice way to put thoughts in story ! I really love reading your blogs with such short stories !! & Yes the Cybage Annual Bash speech too !!! What i like about your writing is always relating story to Issue Evolving around us.That make it special for readers to co-relate and understand better.A small quote “Everyone wants a gud life but does everyone get a Gud life”. Felt like reading (and realising) my current condition…If this is the case for a 20 something normal working guy in India following this US election for the past few months..I can only imagine the level of disorder the US people are dealing with right now (not to mention the US Media efforts to brainwash their people). Now that i have realised my problem (Thanks to you)..it’s time for me to unsubscribe Stephen Colbert, John Oliver, Trever Noah, Jimmy Kimmel, CNN, FOX, BBC, ABC, CW and so many that I never knew before. Just came across this blog coz of my roommate who saw me watching political videos and news in middle of the night with some beers. Not a normal behaviour for an young Indian lad he thought. Great words of wisdom from a wise man. No doubt it is true that a habit can make or break a person. A person is what he thinks and does daily without fail. A habit that brings value(maybe personally, professionally, spiritually) to a persons life is worth having and can be termed as good habit. A habit that brings no value can be term as a bad habit. You have brilliantly mentioned in your blog that how OCD, a bad habit, has disrupted your life, how you have identified that bad habit and taken necessary steps to break out of it. Thanks for sharing this awareness with everyone. OCD is a something which everyone of us go through at each stage of our life. But I believe it actually teaches us to overcome our obsessions using our strengths. And this is the precious way through which we can realize our strengths to fight against the massive obstacles in our life. Sir, reading your post has given me an amazing inspiration which will help me to tackle OCD, if it again arrives in my most precious stage of life that is “Future”.